In recent years, social media such as Facebook is playing an increasingly large role in social activism. 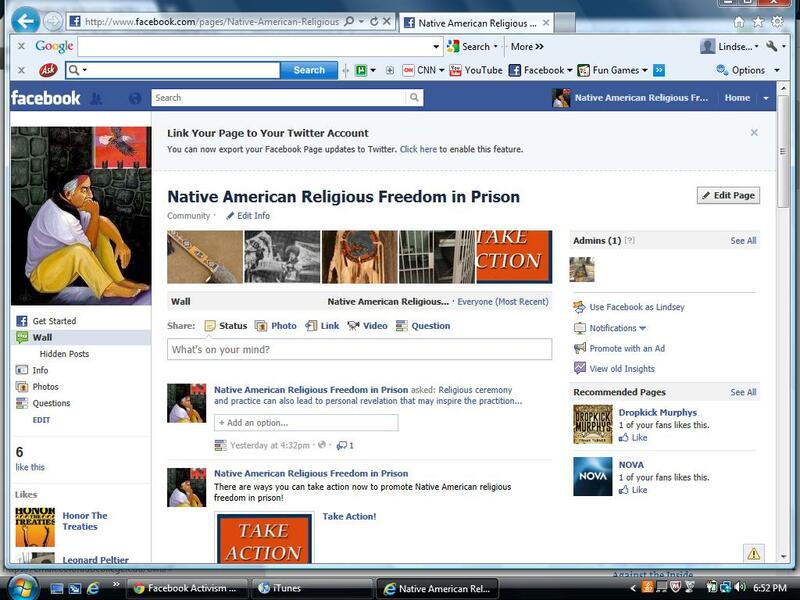 Description of “Native American Religious Freedom in Prison” Facebook Page: This is a group to promote the free exercise of Native American religious traditions by prisoners. For years, Native American religious freedom behind bars has been challenged though the restriction of access to sweat lodges and tobacco, the disrespect and confiscation of religious items such as peace pipes and medicine bags, and the restriction of time in isolation for purification ceremonies. This group aims to increase awareness of the plight these Native American inmates face in practicing their belief systems and to equip the public with the tools they need to enact change. I included pictures of important religious items (such as sweat lodges, peace pipes and medicine bags) and information on how the use of these items has been restricted in prison. I also included a picture of a prison cell and a link to an article challenging the US prison system more broadly and the practice of retributive justice. 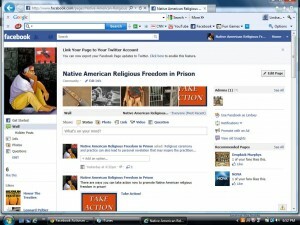 The next post is a recent success story about religious freedom rights being returned in Washington Prisons. I thought it would be good to include this story to show that progress is being made within the movement on a case by case basis. Next I included a list of four blurbs on recent prisoner free-exercise cases related to Native American religious traditions. This is to show the contemporary relevance of this issue. The next post encourages the viewer to Take Action! I suggest several ways to do this. Write your representative telling them you care about this issue, sign a petition in support of a Native American prisoner on a hunger strike for religious freedom, host an event to raise awareness, make posters, write your own petition or find a way to let presidential candidate for the next election know it’s an issue you care about. Finally, I posted a question asking for stories of how religion has positively impacted your life or the life of someone you know. This is to show the personally transformative powers of religious practice that further support its free-exercise in prison. I answer the question with the story of meeting “Fred” at Pine Ridge and talking about what medicine man “John” said about encounters with Spirit changing people for the better. United States Commission on Civil Rights. Enforcing Religious Freedom in Prison.Washington, DC: Commission on Civil Rights, 2008. Religion Clause. Recent Prisoner Free Exercise Cases (October 16, 2011). http://religionclause.blogspot.com/2011/10/recent-prisoner-free-exercise-cases_16.html. Brooks, Laura. Traveling the Spiritual Path: The Struggle for Native American Religious Freedom. http://www.dickshovel.com/nar.html.